Fresh start available in Windows 10 Creators Update (Version 1703), is a great way to start fresh with a brand new computer or start fresh with a Windows 10 computer that isn’t running very well. 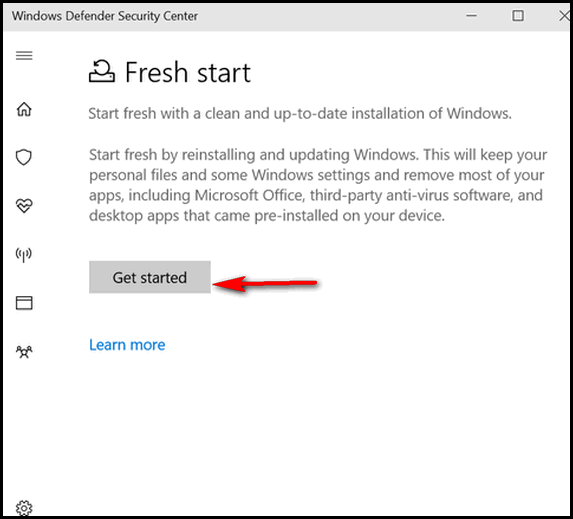 Fresh start clean installs a fresh up-to-date copy of Windows 10, while saving your personal files and some of your Windows settings. It’s a great way to start fresh with a new computer, or start fresh with any Windows 10 computer that has Windows 10 Creators Update (version 1703) or newer installed. 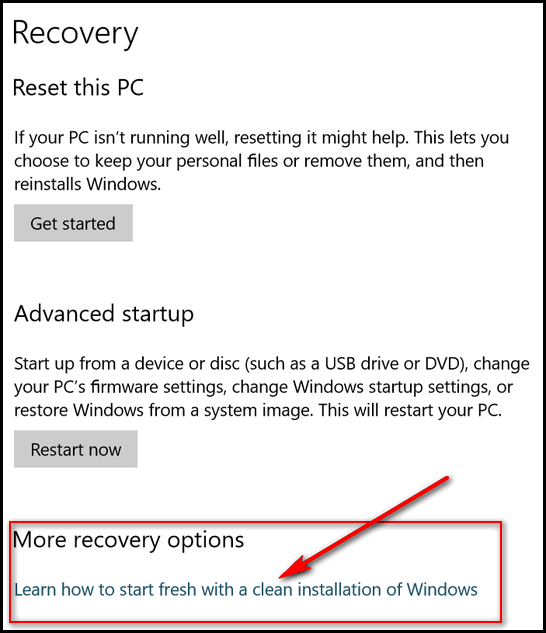 Fresh start is a great way to rid a brand new computer of the pre-installed bloatware and trialware that manufacturers love to install on new computers, as they try to squeeze out an extra buck or two… or Fresh start may be just the ticket to fix Windows 10 computer that isn’t running very well or is barely running at all. Before you do a Fresh start, we recommend that you have good backup of all your personal files. While Microsoft says a Fresh start saves your personal files and some of your settings, it’s better to be extra safe than extra sorry. Also keep in mind, if you do a Fresh start on a computer you’ve been using for a while, you’ll all the programs and apps you have installed, will have to be reinstalled after Fresh start completes. Fresh start is different than Windows 10 Reset. Windows 10 Reset resets your computer with all the pre-loaded manufacturer bloatware, trialware and pre-loaded Windows 10 apps. In other words it does not do a clean install of Windows. Fresh start, saves your personal files and some of your Windows settings, wipes out everything else, installs a clean, updated copy of Windows and then returns your personal files and folders back to their previous locations. With all that stuff out of the way… let’s begin. Fresh start is super easy to do. REMEMBER – this is important: Fresh start will wipe out all the manufacturer’s bloatware and trialware and preinstalled apps. However it will also wipe out any programs (antivirus, Office, etc.) you installed on the computer. And though Microsoft claims Fresh start will keep your personal files and some of your settings, we highly recommend that you have a good backup of all your personal files (pictures, music, documents, videos, movies, etc.) before you begin the Fresh Start. Fresh start really means a fresh start. Are you ready for a Fresh start? If I do a get a fresh start on my windows 10 will it also wipe out my Emsisoft on desk top or Avast on my laptop? Hi Joyce, as stated in the article, Fresh start saves your personal files (pictures, documents, music, videos) and removes everything else – that means all your programs. Then it installs a fresh copy of Windows and puts your files and folders back where they were. You will need to reinstall any program that does not come with Windows, that includes Chrome, Firefox, MS Office, Emsisoft, etc. You can reinstall Emsisoft and use the same license, you don’t lose time/days by doing this. Fresh start saves your personal files – not programs. It wipes your hard drive and clean install Windows and puts your personal files back on your PC. You will have to reinstall your programs. Avast and Emsisoft are both programs. Your Emsisoft key is good until its expiration date, so when you reinstall Emsisoft, you can use your current key assuming their is time left on it. I too am wondering about my Emisoft. I just renewed mine. Hi Patricia. As stated in the article, Fresh start saves your personal files (pictures, documents, music, videos) and removes everything else – that means all your programs. Then it installs a fresh copy of Windows and puts your files and folders back where they were. You will need to reinstall any program that does not come with Windows, that includes Chrome, Firefox, MS Office, Emsisoft, etc. You can reinstall Emsisoft and use the same license, you don’t lose time/days by doing this. Fresh start erases all programs and saves your personal files. Wipes the hard drive and clean installs Windows and puts your personal files back. You would need to reinstall Emsisoft, but you can use your current key. Can I use 1 of my key numbers and have you guys do the fresh start for me? Also help me get my Emsisoft back running plus my Malwarebytes going again? Will this fresh start have Office in it? I have Office now. Fresh start saves your personal files, erases everything, then clean installs Windows then puts your personal files back. Personal files don’t mean programs… personal files mean files like your pictures, documents, music, text files, bookmarks (if you saved them to a file), etc. Things like Emsisoft, Malwarebytes and Office are not personal files, they’re programs. Fresh start is not something be done unless you’re having severe computer problems. If you’re using Emsisoft, you don’t need Malwarebytes. If you wish to run Malwarebytes too, then you should ask Malwarebytes support for assistance if it’s not working. Are you having severe computer problems or just problems with some programs. We can set up a Fresh start for you, but as you can see from the article – it’s just a matter of 3 or 4 clicks. Once Fresh start begins, you’ll be offline until it completes. What would be helpful is to have us look at your PC and see if you really need to do a Fresh start at all or just need a few things fixed. Ever since windows did the update for the Creator, I have a graphic program that will not open , it opens and starts to run then hangs up and shuts off from loading. The program that will not open is: Corel Photoimpact x3 , it is a graphic program and I have been using for years it worked fine until last Friday when my computer did a update for windows 10 and it put the Creator on my computer, Can you help me get my program to open ?? You will need to contact Corel. Corel seems to have problems keeping some of their programs updated. I know that some of their PaintShop Pro versions are having problems. I have windows 10…how do I get the Creators Update? And do I want it? I will shortley be selling my old computer, Win 10 1803; for a high level Laptop. but a fresh Win 10. How do I do this? Items on the Web are confusing to me, I`m an old guy. See our post here for step-by-step instructions on how to wipe your personal files and all your programs and install a fresh copy of Windows 10.